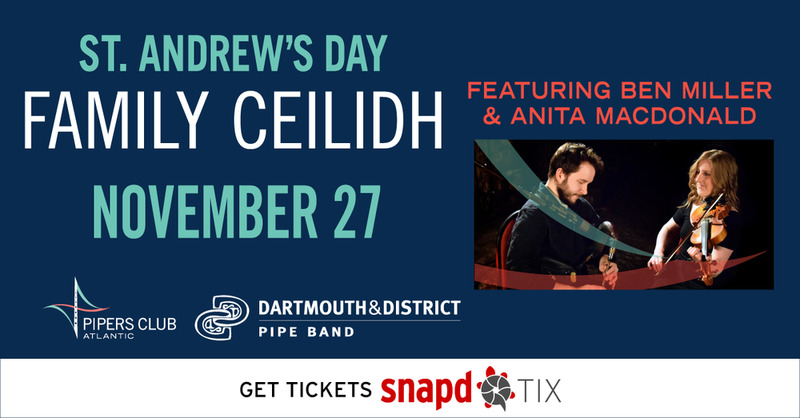 Join us for a St. Andrew's Day Family Ceilidh featuring Ben Miller and Anita MacDonald. Combining the fiery edge of the Scottish Border pipes with the rich sounds of the Cape Breton fiddle, Ben and Anita merge traditional influences from Cape Breton and Prince Edward Island, as well as the Highlands and Islands of Scotland. This fresh and talented duo pairs driving dance-tunes with expressive Gaelic airs and songs, bringing their listeners a powerful combination of passion and grace. Don’t miss the launch of the new Pipers Club Atlantic with special announcements about upcoming dates, performers, and sponsors. There will also be performances by Dartmouth & District Pipe Band. Proceeds from the event will be donated to the band.